Warning: NOT a zombie movie. This is about terminal illness. Maggie comes home to the Midwest, from the Big Bad City, with a contagious disease. This is the story of her slowly dying while putting her family at risk*. There are more scenes with guns than there are zombies. There are exactly three "turned" aka zombified people on-screen. Ever. Only one is marginally threatening and it shows up in a gas station bathroom that is legit more terrifying than the zombie. If you like sappy morality plays on the dangers of leaving home/"the heartland", this is it. If you want a heavy-handed dissertation on how it's your responsibility to manage yourself** if you have a terminal illness, this is it. If you'd like a treatise on the evils of government-run programs for the terminally ill, this is it. For an opus on how the rules just shouldn't apply to the right people, this is it. If you dislike gore, horror, thrills, suspense, or action, this is the movie for you. 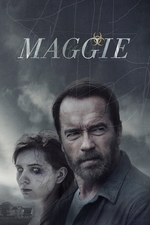 An animal is eaten then shot, people are bitten, the world has changed substantially, and Maggie kills herself (finally taking "responsibility" instead of forcing her poor, righteous, long-suffering, DUMBASS father to do it); not one second of any that appears on-screen. *To be fair, Maggie didn't initially choose to endanger her family. Her father chose to take her home and put her in that situation. **There are three options for dealing with the contagion shown. 1. Caring for the ill yourself until they escape and someone else is forced to kill them. 2. Caring for them until they are taken away to die in government institutions. 3. Caring for them until they kill themselves. Guess which one leads to a heaven of roses and white lights and pretty flowers? But isn't this the movie where Arnold Schwarzenegger cries salty tears of sadness? That's so disappointing. I've had some ideas about using a zombie story to talk about chronic/terminal illness onstage, and I thought (by the previews) that this movie was taking this direction, but it sounds like it's more a political screed than anything.